I will adopt the classic trap-neuter-return or TNR in this article. The most import issue with respect to this process is whether it is effective in managing feral cats. But first, what is it? 1. Individual people or private organizations want to help the feral cat. It is a rather unpleasant life as a feral cat. It is a short life estimated in the region of 3 – 6 years. The average domestic cat very often lives well beyond 15 years, three times longer. Individuals either in groups or alone carry out TNR to assist the feral cat generally as it prevents more ferals being born and therefore prevents more suffering. 2. Local authorities feel an obligation to control the feral cat population in the interests of health and safety (spread of disease they say). They also sometimes decide to control feral cats to protect predation upon native wildlife. These are controversial points though. In a basic sense feral cats are trapped in metal cages using food bait. Feral cats can live in colonies and the placing of traps is not that complicated but care and precautions are needed. For example you don’t want to trap someone’s domestic cat, do you?! for females) or neutering (males) operation. This is a fast process in experienced hands and takes place in a conveyor belt manner if there are large numbers trapped. The Flickr photographer, Feral Indeed! participates in feral cat clinics and she says that on one Sunday in 2008, 280 feral cats were spayed or neutered. She took the photo of feral cats lined up at the clinic. The feral cat clinic that she is involved in goes out once a month. The clinic is made up of volunteers, vets and rescue groups. Not only are the feral cats spayed and neutered they are also “cleaned up, vaccinated, and some tested for Leukemia and Feline Aids”. These are the big two diseases that commonly befall a feral cat. TNR programs may also involve vaccinating cats against certain diseases like rabies, feline panleukopenia, herpes, and calicivirus. Once the cats have been treated some are taken back to where they were trapped. Their ear flaps are clipped to signify that they have undergone the TNR process. These cats will live their lives as before but not reproduce. Others, the kittens that are adoptable, go to foster homes. A foster home is a temporary home were a feral kitten lives with a person who volunteers to care for the cat pending permanent re-homing through, perhaps a rescue center’s network of contacts etc. For example, “PetSmart Stores offer the adoptable cats and kittens for the rescue organizations” says Feral Indeed! who is an American female who doesn’t provide her name. That, then, is the basic process. The “feral cat problem” is a world wide problem but it is more high profile in America, the home of the largest number of purebred cats, domestic cats, stray cats and feral cats. Everything is bigger in America. The number of feral cats in the USA approximately equals the number of domestic cats. In 1994 there were about 60 million feral cats in the USA. There are an estimated 80 million currently (2010). But the figure is not exactly known. In fact it is probably guessed! The high number is due to uncontrolled ad hoc breeding (failure to neuter domestic cats and dumping them) and “whole” feral cats breeding as they will. It is worth mentioning right away that cats do not breed as many people, including experts, have said. There have been grossly exaggerated statements of rampant breeding that have coloured the attitudes of local authorities and bird conservation groups. Please read this for the truth: How Fast Do Cats Breed? Martha Kane and Richard Vella manage a number of feral cat colonies in Malta, which includes maintaining the colony through feeding and TNR as part of the process. Also stray and feral cats are still largely destroyed by rescue centers on the basis that there are not enough homes for them to go to. This is a controversial point too. Nathan Winograd in his book, “REDEMPTION” says that there are enough homes for unwanted cats. The so called “No Kill Rescue Shelters” are simply not doing enough to find them. The truth is that the concept of trap-neuter-return and the re-homing of feral cats is still work in progress. It is not a universally accepted process. For instance in Australia, where they are terrified of losing their native species to the feral cat, in some states the authorities allow people to go around shooting them! A purebred Bengal cat was shot. This is known not to work because of the vacuum phenomenon. Despite this and out of what seems like desperation, they simply try and exterminate them. The authorities fail to accept that Australians created the problem and that Australians, through their activities, probably kill more native species than all feral cats combined. Oh, I nearly forgot to mention that shooting cats is inhumane – a point overlooked by some Australians. Sorry Australia, but you have this wrong. I don’t think we have to ask this question. TNR It is the only humane way to manage feral cat populations. There are currently no alternatives that are humane and at a fundamental level, effective. And it must go without saying that on a commonsense basis, if we neuter cats so that they can’t breed the po pulation must fall and in the long term be eliminated. TNR programs are long term processes while trapping and killing or plain shooting or poisoning is short term thinking. Long term thinking is a far superior process as it is more effective and balanced. Humankind tends to opt for the easy short term route until it becomes absolutely necessary to take the harder but more enduring route, which in this case is trap-neuter-return. As I see it, the problem is not whether trap-neuter-return is effective. Commonsense dictates that it is. The issue is how effective we are in carrying out the process. If it is done in isolated places there is the possibility that people hear about it and dump their cats there knowing that someone is managing the feral cat in that area. Also within the trap-neuter-return system caring volunteers and rescue groups feed feral cats as this is humane and preparation for neutering and treating for health issues. Many people don’t like other people feeding feral cats. The world is polarised on the issue feral cats. A classic example was the case of the HELP FIGHT BEVERLY HILLS MUNICIPAL CODE. Beverly Hills came through with flying colors and did the right thing thankfully. 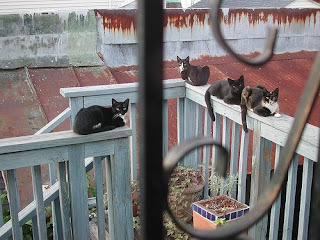 Also see: The Rescue and Feral Cats of Martha Kane. For me the weakness of trap-neuter-return is that it is not done widely enough; it is work in progress and there is some resistance to it. If it was done nationwide under government control and funding (a highly unlikely scenario) resulting in nearly every feral cat being neutered, it must certainly be a success, surely. The program needs coordination at a national level. And it needs to be carried out in coordination with better domestic cat caretaking – i.e. a reduction in abandonments. An example of how trap-neuter-return on a large scale can hopefully save the Scottish wildcat can be seen in this article: Effective trap, neuter, return programs. The long term effectiveness of trap-neuter-return is accepted as effective in stopping the breeding of cats in the wild and reducing the population over time. Since the 1980s, trap-neuter-return has become more accepted as the best way of managing the feral cat population. As at 2003 Linda P. Case in her book, The Cat, Its Behavior, Nutrition & Health, states that “TTVAR programs are still new but are increasing in use…”. She says that trap-neuter-return provides a humane alternative, to killing cats, in dealing with the problem of unwanted feral cat populations. Some US cities are more enlightened than others. Two Californian cities take different approaches. Beverly Hills is more enlightened than Los Angeles it could be argued. LA was the battle ground between bird conservationists and feral cat rescue groups. One transparent difficulty is the lack of reliable data on how feral cats impinge upon wildlife and bird populations in particular. Groups use data to serve their own purpose. In certain eastern European countries there may be a gradual awakening to the process, replacing the attempted extermination through shooting or poisons. Feral cats are poisoned in some Mediterranean countries: The Yearly Cull of Cats in Greece. More work needs to be done on assessing the effectiveness of TNR programs or perhaps the better way to say that is more work needs to be done on how to make TNR more effective as it is the only way that we have to control feral cat populations humanely and in the long term. For the record a study in San Mateo County, California concluded that TNR had reduced feral cat populations by 29%. This is a controversial point too. My research indicates that there are no studies that conclusively prove that feral cats decimate wildlife or affect it in a way that demands immediate extermination of the cat. See for example: Domestic cats do not decimate bird populations. There are instances where domestic cats on small islands have had an impact on wildlife. This, though, is our fault and this must be taken into account when deciding what to do. How Feral Cats Affect Wildlife. This entry was posted in Animal Rescue, Animal Rights, Feral Cats and tagged trap neuter return by Michael Broad. Bookmark the permalink.